Do you understand the "donkey language"? At the full-day event we teach children how to deal with the donkeys and convey facts about attitude and the nature of long-eared bats. Fun and games, as well as discovering the area around the donkey farm are also parts of the adventure day. 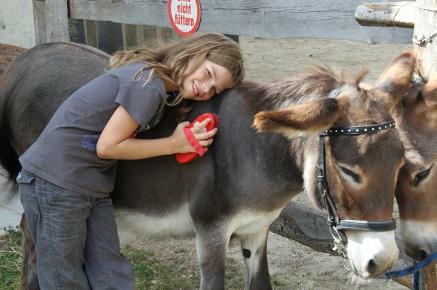 We will clean and pet the donkeys. Hear about the housing, feeding and care, as well as on the characteristics of long-eared bats. We learn about the differences between donkey and horse and walk with the donkeys. 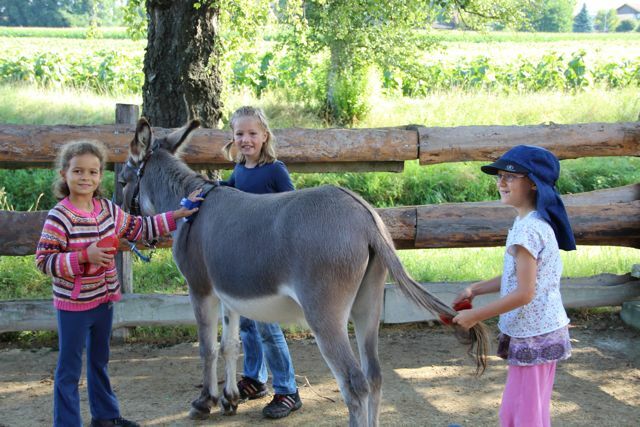 Each child will have the opportunity to ride on the donkey at least once and to lead it. We sing songs, play maybe a game, draw / do sam handicraft work or listen to a tale in the haystack. We will barbecue and grill some bred, make popcorn and eat the brought picnic together. We recommend good shoes. Persons riding may bring their own helmet, otherwise, however, we also have some riding helmets here. You are welcome to combine your full-day event with an overnight stay - for details go to "Lodging".